Crab stock is a mainstay in my kitchen during Dungeness crab season, which in California runs from November through June. But you can legally catch red and rock crabs all year long, and they make a fine stock, too. After picking the meat out of the crabs, I use the leftover shells to make this rich broth. I find that the best bits for a good crab stock are the shells from the legs, as well as the top shell. 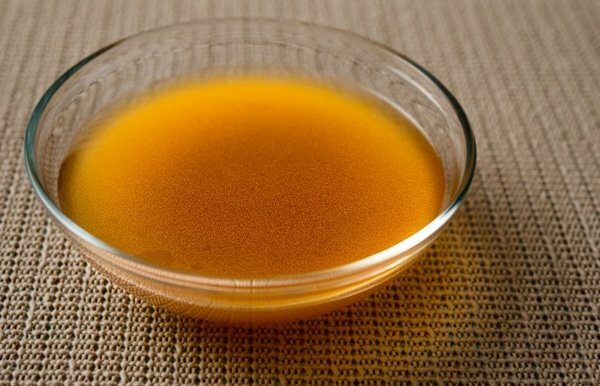 If you use the inner shell bits from the body, there’s a lot of fat in there that can cloud the stock. If you aren’t worried about that, go right ahead. If you want a clear crab stock, the easiest thing to do is freeze it, then let it thaw through a regular coffee filter, which will filter out the fine particulates that are clouding the stock. It takes a few hours, and you can do it at room temperature, or in the fridge overnight. Another tip for a clearer stock is to never let it boil. Boiling will cloud a crab stock worse than most other stocks; not sure why that is. Obviously you can make a crab stock out of any crab. I’ve done it with pretty much every species of crab in North America, including the shells from snow and king crab legs. You can also substitute lobsters or shrimp for this recipe, too. 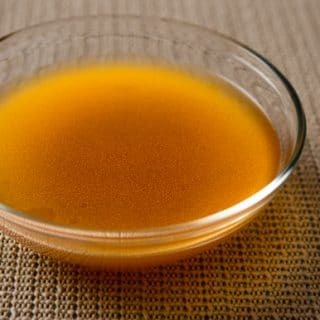 Use this stock in seafood soups and stews, as a base for a French crab sauce like Nantua (normally made with crayfish), or Crab Risotto or in Crab Curry. The vegetables in here are what I use, and are open to substitution: The only ones you really need are the onions (or leeks), and celery. I also think fennel adds a lot here. If you can't find it, add fennel seeds, or even a shot of ouzo or other anise-flavored liqueur. Use any crabs you have available. A couple of pointers: Don't let this boil (you want a gentle simmer) and don't be tempted to simmer it for more than 2 hours or it will lose flavor and get cloudy. I typically go for 90 minutes. Heat the olive oil in a large stockpot and saute the vegetables over high heat for 5 minutes, stirring often, until the onions are translucent. Add the tomato paste, stir well and cook over medium heat for another 2 or 3 minutes, until it darkens. Add the crab shells and bodies and smash them all with a potato masher. Mix well to coat with the tomato paste and to disperse the veggies. Cook for another 2 to 3 minutes, stirring a couple times. Add the white wine, bay leaves and peppercorns and bring to a boil. Let this cook for a minute or two, then pour in enough cold water to cover everything by about an inch; normally this is about 10 cups. Let this simmer very gently for 90 minutes to 2 hours. Add salt to taste. Turn off the heat. Set up another large pot or bowls and put a fine-meshed strainer over it. Line the strainer with a plain paper towel or cheesecloth and ladle the stock through this set-up into the large pot or bowls. Do not try to get the last dregs of stock, as this will be full of debris. Discard the shells, etc. Let the stock cool for 15 to 30 minutes, then use or pour into quart jars. The stock will keep for a week in the fridge. It will freeze well for 2 months, but after that it deteriorates rapidly. 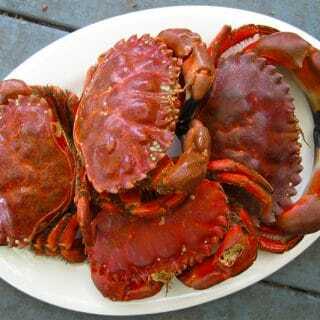 You can find all sorts of recipes for crabs and other shellfish right here on Hunter Angler Gardener Cook! Is this raw shells or like left over boiled shells? B: Either raw or pre-cooked works.